KERRY County Council today hosted a Civic Reception to honour the work of Fionnbar and Elma Walsh and the Donal Walsh #Livelife Foundation. 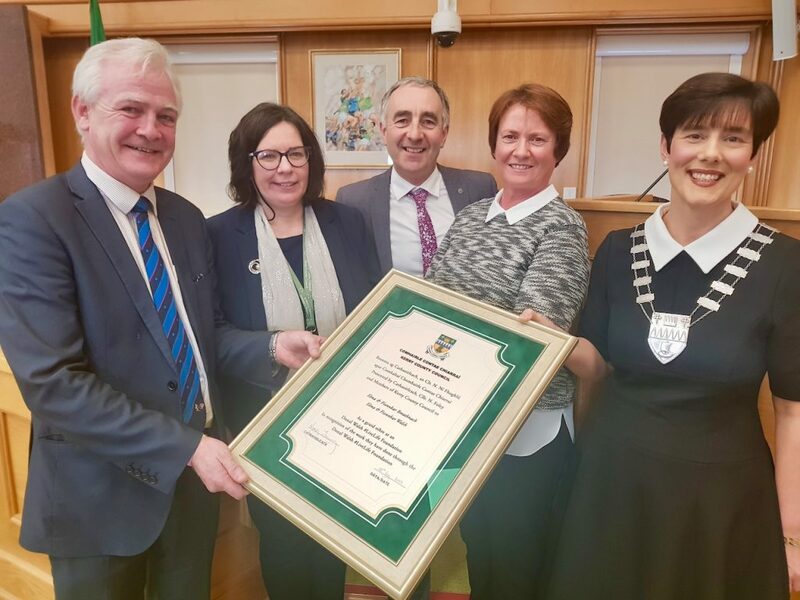 At a reception at County Buildings in Tralee, the legacy of Donal Walsh and the work being done by his parents to promote his message of positivity was acknowledged by the Cathaoirleach of Kerry County Council, Cllr Norma Foley and her elected colleagues. Members of the Walsh family as well as family and friends of the late Donal Walsh were present in the Council Chamber to hear congratulations for the efforts of the foundation which has raised over €500,000 for charitable causes. It was also noted that Fionnbar and Elma Walsh have brought Donal’s message to 50,000 students per annum through visits to schools around the country in recent years. In her remarks, Cllr Foley said: “A Civic Reception is the single highest honour that can be bestowed by Kerry County Council and the people of Kerry. It is conferred upon those who by their deeds and actions bring both honour and distinction to our county. “I can think of no couple or indeed no organisation more worthy of today’s reception than Fionnbar and Elma Walsh and the Donal Walsh Live Life Foundation. Fionnbar and Elma, today Kerry County Council and the people of Kerry make a public statement of our admiration and appreciation for your exceptional work and the rich tapestry of achievement by the Donal Walsh Live Life Foundation. “When Donal appeared on the Brendan O’Connor Show on RTÉ in 2013, when battling cancer at the age of just 16, it had a deeply profound impact on everyone watching. One cannot watch that interview, even now, without forcing yourself to think deeply about life, about the challenges life presents, and how to confront and deal with adversity. Cathaoirleach Foley said that Donal’s message also resonated with sports stars and celebrities who relayed and echoed what he had to say. Paul O’Connell, Ronan O’Gara, Conor Cusack and others used their profiles to repeat and acknowledge the words of their friend.